Convert AVI to iPad, iPhone, Xbox, and more formats. So if you want to play AVI on iPad smoothly or want to convert AVI to iPad supported formats, a good professional program is needed. To help you play AVI files on iPad listed below are the best solutions. 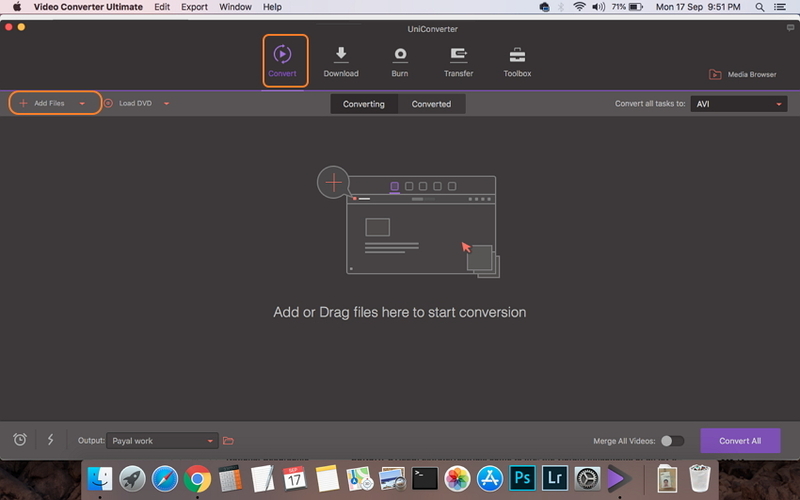 Wondershare UniConverter for Mac (originally Wondershare Video Converter Ultimate for Mac) is the best software for all your file conversion needs. The program supports over 1000 formats for conversion and has preset for all popular devices including iPad. So you can convert your AVI, MKV, MOV, and all other file types to iPad supported format for smooth playback without any compatibility or codecs issue. The software also allows video customization with features like cutting, cropping, adding effects, and others. With APEXTRANS technology, files are converted at super fast speed with just a few clicks. 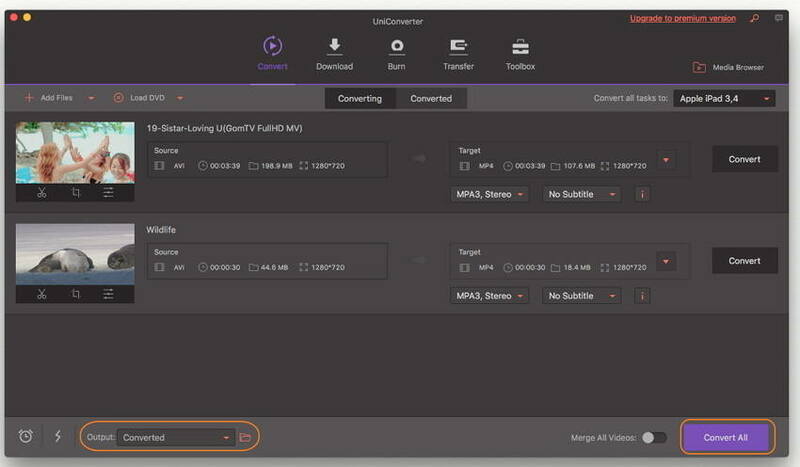 Get your videos converted in high-quality professional files with batch processing support using Wondershare UniConverter (originally Wondershare Video Converter Ultimate). Once the files are converted, you can transfer and watch AVI on iPad. Convert AVI to MP4, WMV, AVI, MOV, and other 1000 formats without quality loss. Convert AVI to optimized conversion presets for iDVD, iMovie, Final Cut Pro. Step 1 Load AVI files to Wondershare AVI converter Mac. Open Wondershare UniConverter for Mac (originally Wondershare Video Converter Ultimate for Mac) on your computer. From the Convert section, click the +Add Files button to import local AVI files. Multiple files can be added for batch processing. Step 2 Choose iPad supported format. On the top-right corner, open the drop-down menu at the Convert all tasks to: option. From the Device tab, choose Apple and the desired iPad model. Step 3 Convert AVI to iPad Mac. 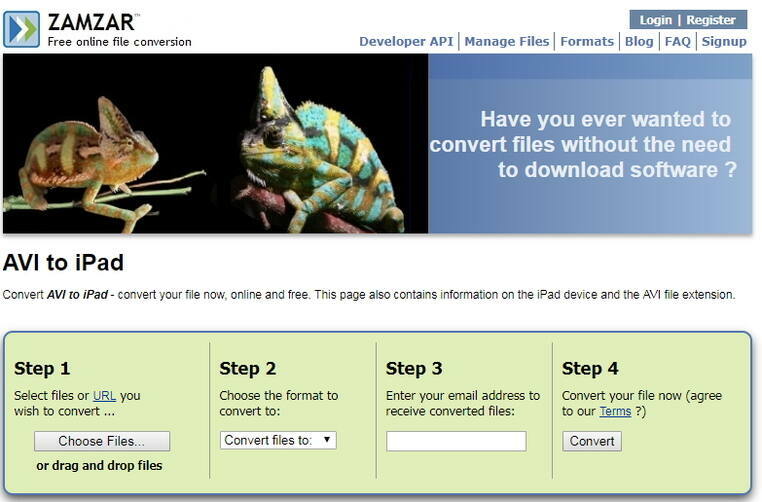 Click the Convert All button to converting AVI files to iPad supported format. 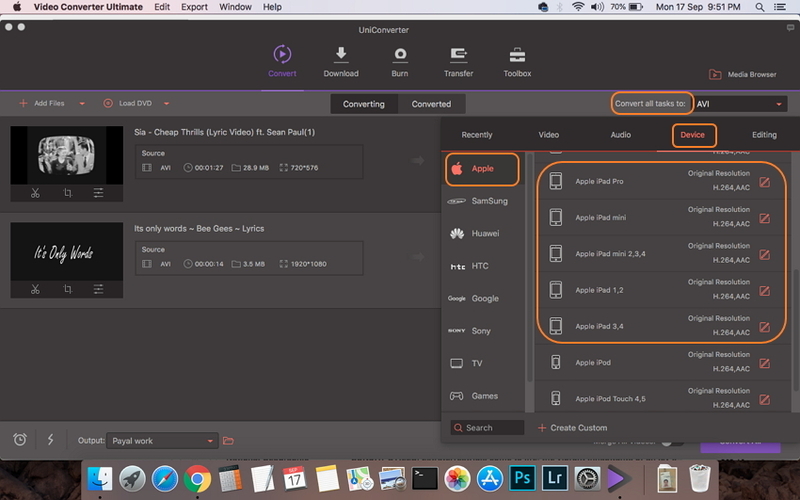 If you are in search for free desktop software for converting your AVI files to iPad compatible format, Wondershare Free Video Converter for Mac is an ideal choice. The program supports working on Mac OS X 10.6-10.14 versions and facilitates converting an array of video formats to iOS-compatible formats. The basic editing features allow customization before conversion. Additionally, the program also allows downloading videos from YouTube. Step 1: Add AVI files to the best avi converter for iPad. Download, install and launch Wondershare Free Video Converter for Mac. Select the Convert tab, add AVI files by clicking Add Files. Step 2: Choose iPad compatible format to play AVI on iPad free. Once the AVI files are added, select iPad from the Device > Apple list at the format panel. Step 3: Convert AVI to iPad free. Choose the location on Mac where you want to save the converted file at the Output tab. Click the Convert All button to proceed with the process. So you can play AVI files on iPad smoothly. There are online solutions available as well to convert AVI files to iPad for playback. One such popular program is Zamzar. 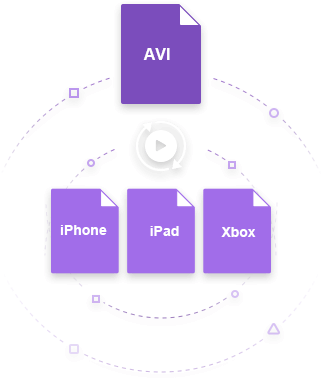 This free to use online converter allows adding AVI as well as other video files and convert it to iPad supported format. The converted files are sent to your mail id for download. You can add the local files or their URL to the tool for conversion. Step 1: Open https://www.zamzar.com/convert/avi-to-iPad/ on your Mac browser. Click on Choose Files to add AVI files from URL or system. You can also drag and drop the files. Step 2: Under the Convert to: tab choose iPad as the desired device. Step 3: Enter email id on which you wish to receive the converted file link. Step 4: Hit the Convert button to start converting AVI files to iPad compatible format. 1. Can iPad play AVI files? iPad supports playing AVI files but only when files are JPEG (M-JPEG) encoded AVI videos (up to 1280x720, 30 fps frames rate, raw audio). So if your AVI file is compressed in the above codec, it will play on your iPad, or else the playback will fail. 2. How to play AVI on iPad without converting? There are a number of player apps for iPad available that allows playing your compatible AVI files on iPad without any conversion. One such decent app that can be downloaded from the app store is PlayerXtreme Media Player. Developed by Xtreme Media Works, the app has a good rating and supports playing videos in a wide range of formats including AVI, FLV, MKV, MOV, and many others. How to Transfer AVI files to iPad? As per the official site of Apple, iTunes only support videos in MOV, M4V, and MP4 format. So in order to transfer AVI files on your iPad and play them using a third party player, iTunes File Sharing feature has to be used. 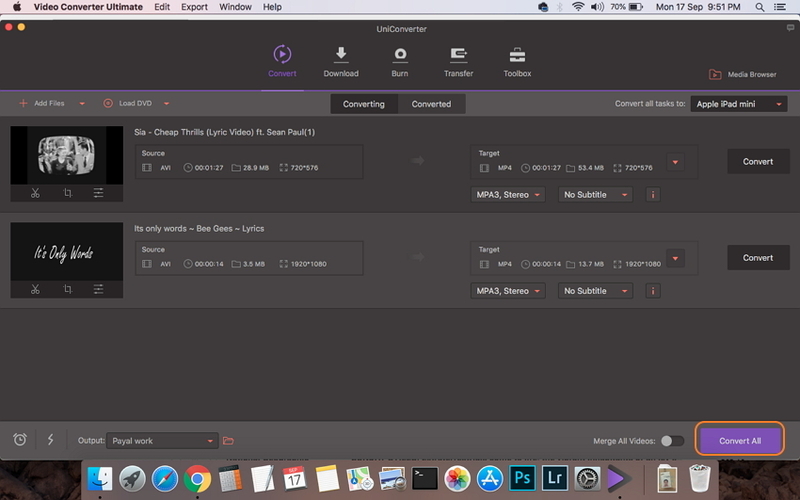 Alternatively, you can also use a professional tool like Wondershare UniConverter (originally Wondershare Video Converter Ultimate) that facilitates transferring videos to iPad without any need for iTunes.